Heat your oven to 350 degrees and line the bottom of an 8x8 inch baking pan with parchment paper. Generously rub the sides of the pan with coconut oil.In a large bowl, beat the maple syrup and coconut oil together using an electric hand beater until creamy and well combined. Stir in the coconut flour and salt until it forms a dough.Press the dough evenly into the bottom of the pan and bake until the edges are a deep golden brown, and the middle is lightly golden, about 14-15 minutes. * Your crust will probably have risen and cracked a little bit when it comes out of the oven, use the pack of a large spoon to pack it down so its flat and crack-free. Let cool for 1 hour before starting the topping. 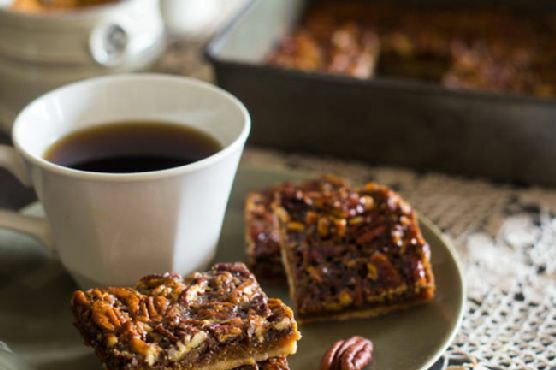 Additionally, as soon as the crust comes out of the oven, whisk the flax meal with the warm water and refrigerate, so the egg can gel up for the hour that the crust is cooling.In the meantime, place the pecans onto a cookie sheet in a single layer and bake them into the oven until they darken and smell "nutty" about 8-10 minutes. Let cool and then roughly chop and set aside.Once the crust has cooled for 1 hours, combine the remaining coconut oil, maple syrup, coconut sugar and salt in a large sauce pan over medium heat and bring to a boil. Boil for one minutes, stirring frequently and then remove from heat. Let the mixture stand at room temperature for 5 minutes.Once it has sat, add the chilled flax eggs and mix well. Finally, stir in the chopped pecans until they are coated in the sugar mixture. Bake until the filling looks set, about 20 minutes. Cream Sherry, Moscato d'Asti, and Port are my top picks for Pecan Pie Bar. A common wine pairing rule is to make sure your wine is sweeter than your food. Delicate desserts go well with Moscato d'Asti, nutty desserts with cream sherry, and caramel or chocolate desserts pair well with port.